Matthew Lowton's swerving shot and a Christian Benteke debut strike gave Aston Villa their first league win of the season and Swansea a first defeat. 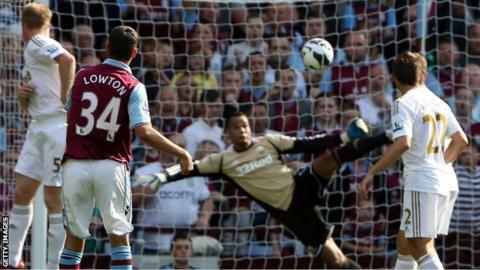 Lowton's spectacular strike, his first for Villa, took a slight deflection but may still have flown past Michel Vorm. Ashley Williams and Nathan Dyer had good early chances for Swansea but the visitors' goal threat was sporadic. Instead it was Villa's big summer recruit Benteke who sealed the win, punishing Williams's defensive blunder. Defensively, Villa showed themselves eager to upset Swansea's smooth passing style, while in attack the home side also showed their intent, full-back Eric Lichaj catching the eye with his forays down the left flank. But it was to Brad Guzan that Villa were initially indebted as the goalkeeper, again preferred to Shay Given, pulled off a fine double save. First the American showed good reactions to beat out Williams's header from a corner, then launched himself to palm away a Nathan Dyer shot after the winger gathered the loose ball. Villa continued to probe and Brett Holman did well to intercept a stray pass and gallop into space on the right. His cross was destined for Darren Bent but Leon Britton had spotted the danger and tracked back to make a timely intervention. Swansea's defence had an unfamiliar look, manager Michael Laudrup having been forced to change two of his back four because of Neil Taylor's broken ankle and Chico Flores's suspension. Teenager Ben Davies continued to show he is an able deputy for left-back Taylor, while Alan Tate returned at centre-back more than a year after breaking his leg in a golf buggy accident. Tate's joy at his return was short-lived however as defender Lowton, a £3m summer buy from Sheffield United, let fly with a speculative shot from 20 yards. The ball just skimmed Tate's head but that was enough to help cause a wild deviation in its flight, completely wrong-footing Vorm in the Swansea goal. The goal was the perfect cue for a minute's applause by the home fans to show support for midfielder Stiliyan Petrov - currently in remission from leukaemia - timed for the 19th minute to honour the Bulgarian's shirt number. Swansea almost claimed an equaliser before the break when Angel Rangel's sublime pass sent Dyer free down the right. The winger cut the ball across for Danny Graham but the striker was just unable to connect with the inviting cross. Villa cranked up the pressure on the visitors after half-time and forced four corners in quick succession, the last causing a scramble in the penalty area. Andreas Weimann picked up the ball with his back to goal but swivelled to shoot off his right foot, only to be denied by the slight frame of Britton on guard at the far post. Laudrup introduced record Swansea signing Pablo Hernandez for his debut in place of Wayne Routledge, but it did little to undo Villa's stranglehold on the game. Tate needed to stretch every neck muscle to cut out a cross meant for Weimann as he surged into the Swansea box. That was the Austrian's last action as Villa boss Paul Lambert sent on £7m deadline-day signing Benteke while another new recruit, Ashley Westwood, also made his debut in place of Stephen Ireland. Benteke was soon in action, the Belgium international seeing his shot deflected wide, while Vorm had to be on his toes to tip Ciaran Clark's header over the bar. The Dutch international again came to Swansea's rescue when Benteke's lay-off allowed Karim El Ahmadi to let fly. Benteke should have opened his Villa account, and made the win safe, when he completely missed Bent's intelligent knock-back - but he swiftly made amends. The Belgian was lurking to pounce when Williams sent a weak header back towards his keeper and Benteke chipped the ball over Vorm. Swansea replacement Luke Moore, on for Graham, had two good chances to give the visitors late hope but Villa saw out a much-needed first win. "I thought Christian was unplayable, he was an absolute threat. "The great thing is he's only 21, only a kid and still learning. "He had a really good game for the national team, if you're holding your own in that company you're doing alright. "Everything is a culture shock for him at the minute but he was excellent. "The goal will give him confidence. The crowd will go with him. You heard the crowd's reaction when he came on." "When things are going well you want the run to continue. "But we had an international break. You never know how the players will be when they get back."